I’ve just spent the last three months conducting many interviews and reading transcripts of some 60 altogether. 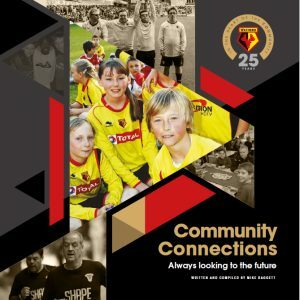 They are all from people in different sectors, of various ages and interests but they are all talking about the Watford FC Community Sports & Education Trust and how it has affected their lives. I’ve now compiled them into a continuous narrative and have just delivered the first draft of Community Connections (working title) the book which will commemorate 25th anniversary of the Trust. It’s now being read by the director, project manager and trustees while I do some picture editing and prepare all 128 pages for the designers. Publication is planned for March next year.